Junior Men (Age 14-18), Eric Martin in erg #6; Alexandar Marteev, erg #7. Photo by Colleen Saville. BOSTON, Mass. – Each year, the C.R.A.S.H. -B Sprints held at Boston University’s Agganis Arena in Boston, Massachusetts, unites some of the world’s top athletes, ranging widely in age, weight class, and experience. From the youth rowing (as young as 12 years old), to the veteran classes (ranging as high as 99 years old), to the lightweights, flyweights, and all the weights in between, C.R.A.S.H. -B’s has been the icon of indoor rowing since 1982, and the 2018 Championships brought all the delight and spectacle that Boston and the rowing community have come to expect. The Sprints kicked off with the 1,000 meter Para events at 9:00 am ET, with notable performances from Sean Gaffney, LTA-PI M, Royal Navy, at a 3:04.1, as well as Kathleen Tarr, LTA-PI W40, Unaffiliated, at a 3:54.5 [RESULTS]. Soon after the Veteran Men, Veteran Women, Lightweight Veteran Men, and Lightweight Veteran Women events began, with impressive racing spanning several different age groups. 97-year-old Dottie Stewart returned to the C.R.A.S.H. -B’s after her 2017 appearance in the LW95 (Age 95-99) category, her participation an incredible accomplishment in and of itself. The Lightweight Men 50 and Lightweight Men 60 included two entries from Prosport Trento Italy from Roberto Rizzato and Emanuele Romoli, respectively. Romoli posted the fastest time in the LM60 category, finishing at a 6:57.2 [RESULTS]. Carla Stein was the erg to watch in the popular Veteran Women (Age 55-59) category, which included an impressive 20 entries. Carla represented Taff Attack / Fletcher Sports Science, rowing a well-paced race to finish at a 7:34.4, winning her class [RESULTS]. In the Veteran Men age 60-64 and 65-69 the top 4 finishers, which included three athletes from the M60 category along with David Frost from the M65, had each athlete take a turn, it seemed, at leading the race. However, it was David Frick of Long Beach Rowing Association to win the M60 event, finishing at a 6:55.4. David Frost took first in the M65 with a 6:58.0 [RESULTS]. In the Veteran Men 50-54 category, Matthew Knifton, Texas Rowing Center, won with a time of 6:18.1 [RESULTS]. As the afternoon progressed, so did the racing, with back-to-back senior events including the Senior Men (Age 40-49), Senior Women (Age 40-49), Lightweight Senior Women (Age 40-49), and Lightweight Senior Men (40-49). In the M40 Marcos Cesar Morales, Raspas A.E., took the hammer home, finishing with a 6:07.5, pursued by Tobias Ayer, Salisbury School, who took second at a 6:13.7, and Derek Silveria, Union Boat Club, taking third at a 6:31.1 [RESULTS]. Jill Hathaway earned first place in the W40 event, finishing at a 7:19.8, 4.2 seconds away from her nearest competitor [RESULTS]. In the Lightweight Men event, Drake Deuel, Harvard Freshman Lightweight, finished first with a 6:05.1 in the LM event, holding an impressive margin over the rest of the field [RESULTS]. In the Lightweight Women category, it was Melissa Patten (U23), Unaffiliated, with a well-paced race to take first, finishing in 7:19.8 and outperforming her seed by nearly 4 seconds [RESULTS]. Some of the most passionate racing came midday with the start the Youth Men (Age 12-13) and Youth Women (Age 12-13), racing for meters against a 4-minute maximum race time, with notable finishes from Adam Conrad of Niskayuna High School at 1161m, and Heather Schmidt also of Niskayuna High School at 1066m [RESULTS; RESULTS]. The Junior Lightweight Women (Age 14-18) saw impressive depth with nearly 60 entries overall. Jenna Cook of Wayland-Weston Rowing Association, Inc. took the lead early and never looked back, averaging a 1:53.9 for her first 500m. Her pacing, particularly for a junior athlete, was perhaps most impressive, as she held steady at a 1:56.5 in the second 500m, a 1:55.8 in the third 500m, finishing her last 500m with a 1:55.5 average for a time of 7:41.7, a margin roughly 8 seconds ahead of second place Anya Buchovecky of Bromfield/Acton-Boxboro Rowing [RESULTS]. The Junior Lightweight Men (Age 14-18) saw similarly aggressive racing, with Henry Bellew of the B-CC Crew Boosters taking home the hammer at a 6:22.0. Behind him was Peter Skinner of New Trier High School Rowing, finishing with a 6:26.7, with Carol Barsotti of New Trier High School Rowing finishing third with a 6:27.6 [RESULTS]. The Junior Men (Age 14-18) and Junior Women (Age 14-18) are each year, reliable fan favorites, and this year they did not disappoint. A thrilling race between JM Alexandr Mateev, Unaffiliated, and Eric Martin, Dallas United Crew, had spectators on the edge of their seats, particularly in the last 500m when Mateev and Martin traded a winning position stroke by stroke. In a gripping finish, Mateev edged Martin just barely, finishing 0.1 seconds ahead for the hammer with a time of 6:11.4 [RESULTS]. The Junior Women (Age 14-18) generated equal excitement, with an incredible performance from Sydney Kend of Saugatuck Rowing Club, finishing at a 7:01.8, ahead of second place Elena Collier-Hezel of West Side Rowing Club at a 7:08.4, and third place Rose O’Connor from Noble and Greenough School at a 7:12.1 [RESULTS]. The Open Men saw notable performances from Andrew Raitto of Merrimac River Rowing Association, Inc., taking the hammer at a 5:54.8,out-performing his seed by nearly 8 seconds. Second place went to Noah Van Dayke (U23), Unaffiliated, with a time of 5:58.6, while third went to Oliver Bub (U23), Unaffiliated, with a time of 6:01.9 [RESULTS]. Finally, the Open Women, unsurprisingly, did not disappoint. 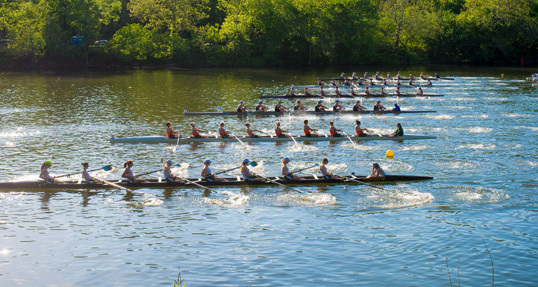 Blue and white stripes ruled this event class, with the top three finishers training out of Riverside Boat Club in Cambridge, Massachusetts. In a thrilling race between Kelly Albanir, Erin Roberts, and Charlotte Smith, it was anyone’s hammer until the last few strokes. Albanir edged Roberts in the end by 0.7 seconds with a winning time of 6:58.7. Roberts and Smith finished in 6:59.4 and 7:03.4, respectively [RESULTS]. For a full list of the event schedule, erg assignments, and results, please follow the below link.